This page describes the problems I had with the Digitrex GKX-9000 DVD recorder in 2004. Partially as a result of this documentation, the seller refunded the purchase price. He did not ask me to return the unit, and from time to time it still comes in handy. This unit apparently has a basic design flaw that frequently causes it to “freeze” during recording. The unit will not respond until the power is cycled (turned off and on again). Any partial recording is lost. Based on this claim, I arranged for a refund of my purchase price. The rest of this page gives more details and may be of interest if you have a Digitrex unit that is either working well (if you have one that has never “frozen”, please let me know) or that is out of warranty. On 19 March 2004 I finally received the Digitrex GKX-9000 DVD recorder that I had bought on Ebay nearly two weeks earlier. It appears to be the same as the Apex DRX-9000, barely warmed over for Australian conditions (for example, the date format is the wrong way round). Note that the Australian site claims it will record on DVD-R and DVD-RW media. I don't believe this. First, the summary: the unit I have received has set an all-time record for unreliability. Of 20 attempted recordings up to 11 April, 7 failed because of product defects (the system hung up), a 35% failure rate. When it does work, the programming sets all-time records for difficulty of use. This does not seem to be an isolated case: the Digitrex forum reports many similar incidents. Based on my experience with this unit, I would strongly recommend against purchasing one of these devices. I asked Digitrex for a statement about their reliability, but after four months, I find my expectations confirmed: they haven't replied to me. 5. In five minutes before it is ready to record the scheduled, it appears a Record Prompt dialog, affirm press OK, abolish press CANCEL, and if without operation for a moment it will record the scheduled automatically. I'm curious about the background of that text; I'd suspect Eastern European. Within a few minutes of installation, I managed to shoot myself in the foot: the player supports “progressive scan”, a new way to say “non-interlaced video”. I didn't know if my TV supported progressive scan, so I tried it. It didn't. Then, of course, I couldn't access the on-screen display, and the non-intuitive method of access (hint: in case of doubt, try Select and look for the tiny error message at the right of the screen) made it impossible to get a display again. It took a while to find the button I/P on the remote control, which toggles between interlaced and non-interlaced video. It's rather obtrusive. It has a loud fan, and the power LED is bright blue, about 2cm wide and 5 mm high. I've covered it over. It's very slow. Functions like channel change have a noticeable delay, and some functions (stop recording, power down) seem to require accessing the DVD+RW: the latter takes about 30 seconds. The on-screen text suggests that it's writing to the DVD+RW, even when no write access seems necessary. It doesn't seem to do any harm, tough. Interrupting it while it is recording is a Bad Idea. I managed to make a coaster out of a DVD+R like that. I also managed to hang a recording on a DVD+RW, and the only way to get any reaction was to power cycle it. This was the first of many hangs; see below. Power cycling makes it forget the date and time. The user interface is very confusing. To change anything, you need to press Select. Do that at the wrong time and you'll erase what was there before (this applies particularly to things like recording dates and times). It seems that the lockup I experienced on 19 March is too common. Some people think it's due to overheating, but at present (20 March) I'm reserving my judgement. It's not overly hot where the recorder is located. It seems that you can't record PAL and NTSC on the same disk, due to different frame rates. The (self-explanatory) error message is Paused for TV System not matching. It seems that the recorder handles all regions. Since I don't have any commercial DVDs, I can't check. The instructions claim somewhere (but I can't find it again) that it isn't possible to copy from the recorded DVDs to VCR, since the DVDs are allegedly copy protected. That may be the case for the Apex device, but it doesn't seem to apply to the Digitrex. I can copy to VCR with no problems. The instructions say nothing that I can see, but it's not possible to copy Macrovision-protected tapes, even with a stabilizer such as the one described at City South Electronics. It's possible that the one they describe here might do the job. There are a number of irritations about this device, but by far the worst could be summed up as: “It doesn't work”. Between 19 March and 10 April 2004, just over three weeks, the system hung six times during recording and did not respond to any input. The partial recording was lost. The only way to recover is to power cycle, which coincidentally causes it to forget the time. This is clearly broken. Maybe I'm cynical, but I don't really expect to hear anything back from them. If I do, I shall report it here. This is really quite a problem. Yes, I could probably send it back and get a refund, but then I either need a new DVD recorder (typically costing twice as much), or I end up sitting on 100 DVD+R and DVD+RW disks. Both are not very satisfactory. 19 March: Hangs during second-ever recording. 20 March: further hang. We lose a recording. 22 March: further hang. We lose a recording. 23 March: further hang. We lose a recording. 5 April: Further hang. We decide to shadow all recordings with the TiVo. 10 April: Another hang. I send a letter to Digitrex contact page. So far, all hangs have been exactly that: the system still passes video and audio data to the outputs, but it does not respond to the remote control or the two on-set buttons. The only way to stop it is to power cycle. On 11 April, the system failed in a different way: the display on the set showed the text Pr0CE, and the on-screen display stated “Error happened Stop recording...”. It also indicated that recording continued, and any attempt to stop produced the message INVALID. It was possible to leave the navigation menu, but the Record indicator continued to show, and nothing else worked, including the on-screen display. This is looking more and more like a software bug. Up to 11 April, we have managed 13 successful recordings on the unit and 7 failures, a spectacular 65% success rate. On Tuesday, 13 April I called the Digitrex customer support line. They don't seem to have their own customer support: the phone menu system announced itself as something like “Australian Warranty Support”. They take my prize for the most irritating hold “music”: radio commercials (which indicated that they're in Sydney) interrupted every minute by a loud beep and the information that I was still in the waiting queue. Finally spoke with Robert, who gave me the address of a local repair place, and also the information that there appeared to have been a lot of problems with hangs in the USA, but not too many here, and that it's probably hardware, either overheating (shouldn't be the case here) or defective components. Now the problem: what do I do while it's being repaired? Wrote to Auctionbrokers, who sold me the unit, and asked them to replace it. I didn't get a reply. I am sorry to hear you have encountered problems with your Digitrex item. get it fixed or if it can not be fixed it will be replaced. contact me. I will be happy to assist. be able to discuss any technical issues etc. Unfortunately, my 14 days had already expired, so I held on. If anybody else should want to buy one of these device. it's obviously worth noting, though. Some DVD+RWs recorded in the recorder would not play on my daughter's DVD player. I was not able to record DVD+Rs at all. I tried three blanks, and none were playable. I suspected the batch of blanks and gave a couple to somebody with a computer DVD+R burner. He reported that the blanks were fine. The Digitrex recorder was not able to play a number of recordings which it had made DVD+RWs: it would just hang at some point. This is a different kind of hang from the “recording” hang: the recorder was still responsive and could back up from this point. It just couldn't display any further. This looked like the previous problem, but when I got a laptop with a DVD drive, I discovered that it had no problems with the disk. In the case I tried, this also applied to my daughter's DVD player: it could play this particular DVD+RW, though the Digitrex could not. This suggests that the drive in the Digitrex is of inferior quality. By mid-July, I still didn't have a replacement for the recorder, but it was becoming clear that it wasn't worth keeping in the condition is was in. On some occasions three out of four recordings would fail. I resolved to bring it to the repairers, though I don't have much confidence that they'll be able to repair it: I believe it's a design issue. On 27 July we brought the unit to Telefix in Adelaide. They initially quoted two weeks, but then claimed they had problems getting parts. My first impression was that Telefix had not found anything wrong with the unit, and it wasn't until some time later that I noticed that they didn't say that the unit didn't fail, just “CONDITIONS AS DESCRIBED IS USUAL FOR THIS MODEL.” The description is clear enough—I had supplied an older version of this web page, so effectively that's what I wrote above. This service report seems to be saying “it's normal for this model to lock up all the time”. 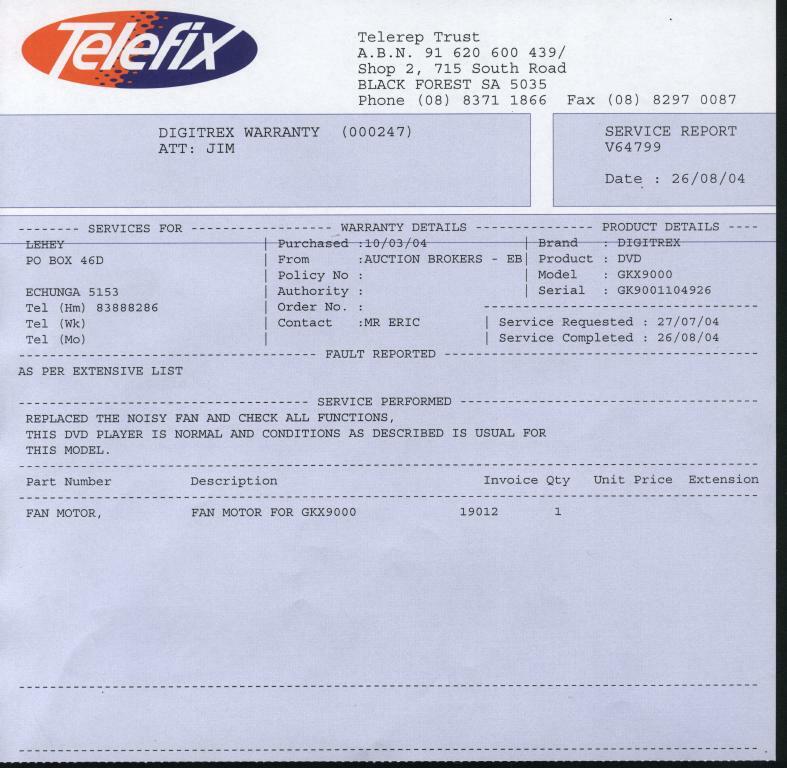 I called Telefix and spoke with Brett, their purchasing officer. He told me there was nobody by the name of Jim there. He didn't connect me to anybody who had worked on the unit, and just claimed to have done a 48 hour “soak test”. He was not able to answer how many recordings were done in this time, nor their outcome. I get the impression that they don't have any set procedure for this kind of test. I later discovered the exact details of the tests: since the unit doesn't erase recording information after completing the recording, the information was still in the recorder when I powered it on again. They made two recordings, both on 23 August, both on channel 28 (SBS). One was for one hour, from 7 pm to 8 pm, the other for 35 minutes, from 9 pm to 9:35 pm. With such short recordings, they had a good chance of success. What now? I'm still wondering how to handle it. Telefix made a good initial impression, but this is ridiculous. In the ten days after getting the machine back, it didn't hang at all, a very long time by comparison with its prior behaviour. Today it did, however—exactly the same symptoms as before. In combination with the service report, I suppose that this means that the machine is not repairable, and that this problem is a known (and evidently irreparable) fault. I shall contact Digitrex and ask for them to refund my money. This page is incomplete. I may update it some time. I did get a refund; see here for details.